Blast Off To The Final Frontierwith 101 Out-Of-This-World Projects You Can Easily Build Yourself! The sky is not the limit! 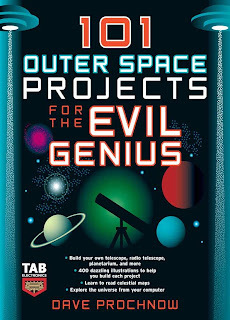 If you yearn to touch the stars, 101 Outer Space Projects for the Evil Genius has everything you need to explore the universe from the comfort of your own home. Whether you're a beginner stargazer or a more experienced astronomer, you'll find an outstanding project to satisfy you, from model rockets and celestial maps to space robots, GPS systems, and much, much more. Despega a la frontera final con 101 proyectos fuera de este mundo, en los que puede construir usted mismo! El cielo no es el límite! Si usted anhela tocar las estrellas, 101 proyectos del Espacio Ultraterrestre para el Genio Malvado tiene todo lo necesario para explorar el universo desde la comodidad de su propia casa. Tanto si eres un astrónomo principiante o un astrónomo de más experiencia, usted encontrará un excelente proyecto para satisfacer, desde modelos de cohetes y los mapas celestes de los robots espaciales, los sistemas de GPS, y mucho, mucho más. Let’s Go Where No Evil Genius Has Gone Before. How to Take a Heading. Make Your Own Maps. How to Determine Altitude. How to Determine Speed. How to Determine Acceleration. How to Use Google™ Earth. How to Get Found When You’re Lost. How to Know the Lat/Long of It. How to Use a GPS Device. Waypoints, Nav Points, and End Points. 3–2–1, Blast Off. A Plan for a Rocket Fighter. How to Design Your Own Rocket. Plop, Plop, Fizz, Fizz, ZOOM. Build a Hydrogen-Oxide Rocket. Put Your Own Eye in the Sky. Bring ’Em Back—Rocket Recovery. Get Higher with Boosters and Multistaged Rockets. Test Before You Fly. A Plan for a Scale Rocket Glider with Remote Control. Launch Effects on Living Critters. Take a Left at Alpha Centauri. Night of the Trifids. Find a Starry Night. Build a Star Catalog. Explore Deep Space. Take a 3-D Adventure into Space. Make Contact. Build a Radio That Doesn’t Require Power. Build a Shortwave Radio. Add an Antenna. Build an Antenna for Star Listening. By Jove, Now You’ve Got It. Use a Commercial Receiver for Radio Astronomy. Listen to the Sun. How to Graph Your Star Sounds. Group Listening. Share Your Sounds with Podcasts. On Your Mark, Get SETI. Going BOINC. Running SETI@home. Setting SETI@home Loose. Team SETI. Building a Giant SETI Ant Farm. You Can’t Tell the Stars Without a Map. How to Address Your Attitude. How to Figure Degrees with Your Fingers. Create Your Own Star Map. Manage the Pleiades. How to Find a Tempest in a Teapot. Create Your Own Full-Sky Star Charts. Learn How to “Map” Your Telescope. Decipher Constellations. White Dwarfs, Supernovae, and Black Holes. Pick a Ride on the Tail of a Comet. One Eye on the Sky. Ahoy Mates, I Spy a Star. How to Assemble a Refractor Telescope. How to Assemble a Reflector Telescope. How to Assemble a Dobsonian Telescope. Track Stars with Clock Drive. When Two Eyes Are Better Than One. Finding Celestial Bodies with a Finder. How to Assemble a Professional-Grade Telescope. Seeing Solar Sights. How to Trail Stars. Astrophotography. The Ideal Star Party Kit. Do-It-Yourself Deep-Sky Photography. Build Your Own CCD Camera. Videotaping the Night Sky. Your First Job Is on Mars. Mars Driver’s Ed 101. Experiment with Feet of Tread. Wheels Are for Moving. Build a Solar Power Array. Watch Out with a Sense of Touch. Move Toward the Light. Record a Martian Scream with a Sound Sensor. Make Your Own Classy Chassis. Tracking Your Movements. Give Your Rover Some Eyes. Add Night Vision to Rover’s Eyes. Control Rover’s Actions with a Programmable Brain. Monitor Your Sensors. Motivate Your Motors. Maintain Your Schedule. Mission: Mars (OK, Your Backyard). Learn How to Maintain Rover’s Power Supply. Program Rover to Navigate Mars. Record Mission Data. Recover Rover and Build Rover II. Build Your Own ISS in Your Backyard. How to Build a Geodesic Dome. Skin That Sucker: Add an Exoskeleton to Your Spaceship. Build Your Own Solar Power Arrays. Make Some Oxygen and Get Rid of Carbon Dioxide. What’s for Dinner?. Learn How to Distill Water. Control Your Climate. Put Waste in its Place. Keep Tabs on Your Mission: Monitor Yourself. Set a Record: Spend 439 Days Inside Your Space Station. You Mean the Big Dipper Isn’t an Ice Cream Cone?. Plan a Trip to the Moon, Alice. How to Show the Phases of the Moon. Build a Home Planetarium. Add a Meteor to Your Planetarium. Take Your Planetarium Outdoors for a Real Star Show. OK, Go Make Your Own Heavenly Bodies. Write Your Own X-Files 284. A Celestial Almanac.